Air Niugini Hoskins was awarded for achieving the best “ On Time Performance “ in 2016, taking over from Madang in terms of aircraft turn around within its port. Hoskins together with Lae, Rabaul, Madang and Mt Hagen are a category A ports that handle two to four flights on a daily basis. 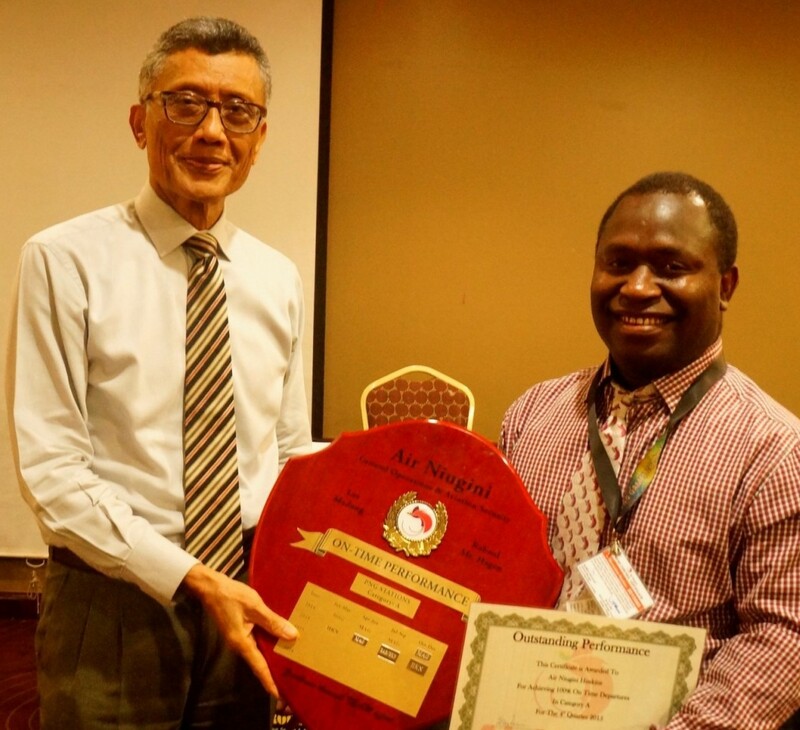 Air Niugini Chief Executive Officer, Mr Simon Foo presented the shield to Hoskins Port Manager, Wesley Taito during the annual Port Managers conference in Port Moresby over the weekend. He commended Mr Taito and his staff for an excellent team work that resulted in them taking the top spot in category A. “All ports are now turning around aircraft within 30 minutes, ensuring details for all passenger, cargo, crew and aircraft are in place and departure is on schedule, I congratulate the Hoskins Port Manager and staff for an excellent performance.” Mr Foo said. Under OTP, Air Niugini’s 23 domestic ports are divided into four categories and according to the number of flights in a day. Madang, Lae, Rabaul and Mt Hagen are in category A, followed by Goroka, Wewak, Hoskins and Manus. The rest fall into category C. The ports with the least number of flights in a week including Daru, Vanimo, Kiunga, Bulolo and Tabubil are in the last category. Port Moresby being the biggest port is categorized separately from other ports. Its competition is between the three shifts. Wewak maintained the shield in category B last year, followed by Popondetta in category C and Daru. Daru also won the prestigious Chief Executive Officer’s award for being the best performing port for 2015. Mr Foo commended all ports who did well in their OTP last year and encouraged staff throughout the domestic network to work smarter to achieve the 100 percent OTP mark. On Time Performance is basically measured on the time taken for a scheduled flight to depart from a point of origin to the point of arrival. It’s the initiative of the current CEO. OTP was implemented towards the end of 2013 following complaints and queries from the traveling public on continuous delays and disruptions. Prior to the implementation of OTP, Air Niugini’s overall average departures were around 40 percent, however since OTP came into effect at the end of 2013, it is now averaging between 80 and 90 percent, there have been days when Air Niugini’s combined OTP for domestic and international flights have reached 100 percent mark. Meanwhile, all Port Managers from Air Niugini’s domestic network met in Port Moresby over the weekend for the Port Managers’ conference. The conference is held annually, where Port Managers discuss achievements and challenges faced at their respective ports, suggest ways to improve with a strong focus on customer services.